Another week, another festival. This one presents 10 Israeli films at Guzzo Mega-Plex Speretech, 3500 Côte Vertu. Single tickets cost $14. April 20, 9 pm: Rock the Casbah, set in a Gaza refugee camp in 1989, reflects tensions among Israeli soldiers and the feelings of a Palestinian family caught in the conflict. Director Yariv Horowitz will be in the audience. April 21, 6:30 pm: The Ballad of the Weeping Spring is a drama about how friends facing moral issues perform a new Middle Eastern symphony to reflect sentiment and memory. April 21 and April 23, 8:30 pm: The World is Funny, Israel’s most popular film last year, takes several individual stories and weaves them into a tragi-comedy set in Tiberias. April 22, 6:30 pm: The Fifth Heaven by Dina Zvi Riklis, set in a Jewish orphanage in WWII Palestine, is a coming-of-age drama. Based on a novel by Rachel Eytan. April 22, 8:30 pm: Lipstikka depicts two Palestinian teenagers with differing sexual attitudes who break curfew, meet Israeli soldiers, then flash forward to their lives in London as they recall their youth. April 23, 6:30 pm: Melting Away is the first Israeli film dealing with the issue of parents who disavow children who come out as transgendered. April 24, 6:30 pm: Epilogue tells of an octogenarian couple and their struggle to live in meagre conditions in a poor section of Tel Aviv. April 24, 8:30 pm: Out in the Dark is about the gay romance between a Palestinian student in Israel and an Israeli lawyer as the student faces loss of his visa and pressure from his conservative family. April 25, 6:30 pm: Life in Stills focuses on a 96-year-old woman and her battle to save her late husband’s photo studio from demolition, with the help of her grandson. Director Barak Hermann will attend. April 25, 8:30 pm: Dolphin Boy is a documentary about an Arab teenager who retreats into himself after a violent experience, getting therapy with dolphins in Eilat. Director Dani Menkin will be there. 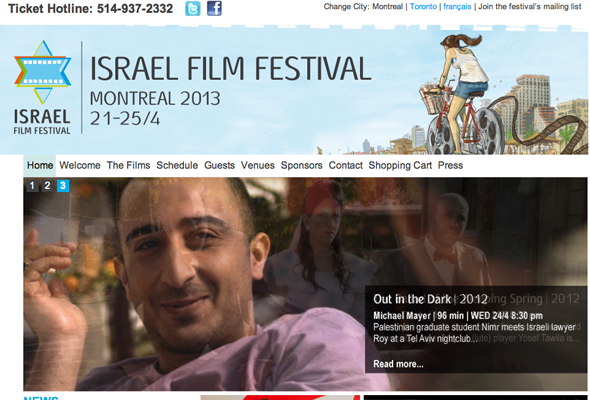 Be the first to comment on "Israeli film fest: Taboos explored"